Yeah, I'm sure I'm not the only one to come up with "Marky Mark & The Monkey Bunch", but it was just too tempting to avoid. While one would thank the Executive Producer in the sky that Tim Burton got to direct this remake of the classic Charlton Heston pic of the late 60s, it is in fact the most disappointing of his films. "What? But how is that possible? He made Batman, Edward Scissorhands, Ed Wood, Sleepy Hollow?! And the make-up, the FX, the spectacle of it all?!" Well, that's all true. And sure, Rick Baker's ape make-up FX (especially that of Tim Roth's villain) is absolutely amazing. 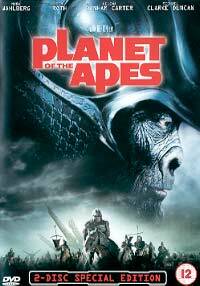 In this big budget version of the space man who crash-lands on a planet where apes are the dominant specie and humans the subservient wild beasts in the bush, many interesting issues do come to the fore (from our intelligence to animal rights, evolution and religion). But, let's remember, the original is a classic, not total genius. While some adaptations of the original tale are converted in an innovative, action driven, thought provoking and at times humourous way, the crappy elements abound. From the gung-ho American stance & the lip glossed blond wild "cutie" to the corny suspense moments & lack of surprise. It's a lovely film to look at, but it lacks that little special something to push it beyond a mere holiday money-spinner. It's a fun film, no doubt about it, just don't expect to talk about it for weeks afterwards.